In light of the above, no-one should be surprised by what is reported in the courageous article by Marcin Fabjanski entitled "Wszyscy wdychali �mier�" (i.e. "All inhaled death") from the Polish magazine "Przekr�j". On 11 September 2005 the text of this article (in Polish) was available in Internet at the address: przekroj.pl/index.php?option=com_content&task=view&id=391&Itemid=49 (Whether it is still there I am not sure, as I know how fast UFOnauts rush to sabotage everything that discloses their secretive occupation of Earth.) The article states, amongst others, quote in my own translation from Polish: "All inhaled death. The death got Polish workers who four years ago worked on the removal of rubbles from the World Trade Centre in New York - already 19 of them are dead. Some of them are returning to Poland to die. [...] In the Mount Sinai hospital they confirm that further 50 is just dying. [...] Polish workers received masks with Hepa filters, but even these would not protect efficiently from the killing exhaustions of the "Ground Zero"; [...] - Firstly was a malignant cancer of the thyroid gland. Then arrived: an infection of the pancreas, a destruction of the bile duck, asthma, rapid overweight (gained 20 kilograms in a half of year), the shrinking of the hole in throat to a half of diameter, asbestosis. He was six times in a hospital, went through two operations during one year, and soon the third one is coming. Victims of the deadly air from the "Ground Zero" sometimes die rapidly - they go along a street, experience an attack of exhaustion, and their lungs collapse. [...] Research in the Mount Sinai School of Medicine of August 2005 indicate, that amongst 11 768 workers and volunteers being investigated, who at some stage worked on the "Ground Zero", 51 percent requires immediate psychiatric assistance. 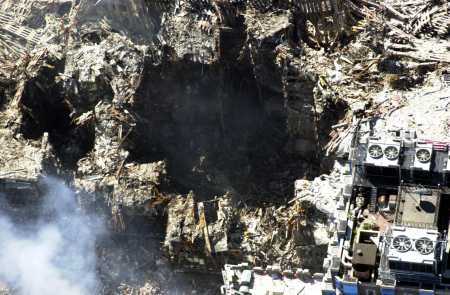 Rescuers from the WTC significantly more frequently than rescuers from any other action, who also were confronted with death, experience attacks of panics and fear. For this research governmental financing was found, but not for healing." Translating the above into our language, UFOnauts systematically murder (and also telepathically and hypnotically torment) even all these witnesses, who only worked on the removal of rubbles from the area where UFOs evaporated WTC buildings. After all, when the humanity awakens from the present blindness one day in the future, and begins to see what UFOnauts are doing to our civilisation, then these witnesses may confirm the fact of evaporation of WTC buildings by UFOs. What a nasty race of evil creatures is occupying our planet! How in such situation not to do all humanly possible to desperately defend ourselves from these satanic UFOnauts! (1) The system of underground tunnels discovered by Juan Moricz in June 1965 in the province Morona-Santiago of Ecuador. It is described and illustrated in two books by Erich von D�niken, namely in [1O8.1] "In Search of Ancient Gods", Souvenir Press, Leeds, England 1973, and in [2O8.1] "The Gold of the Gods" (first published in Germany by Econ Verlag under the title "Aussaat und Kosmos"), Souvenir Press, 1972, ISBN 0-285-62087-8 (then reprinted by Redwood Press, Ltd., Townbridge, England, 1973). Out of these three tunnels, the most easily accessible for research is the Borneo tunnel evaporated by two K8 type UFOs, and called the "Deer Cave" - see a photograph of it shown in "Fig. 2" below. It is open for tourists and practically everyone who can afford a ticket to Borneo, is able to see it and to research it. The appearance of this tunnel is also shown in Figure O6(d) from monograph [1/4]. In turn Figure O1 from monograph [1/4] shows how such an underground tunnel is evaporated by a plasma saw of a UFO, and what attributes must characterise it because of this manner of evaporation. It is worth to notice that also in Poland there is a similar UFO tunnel evaporated under the mountain called "Babia G�ra". Unfortunately in 1930s the commonly known entrance to this tunnel, located not far from the BV mountain shelter, was destroyed. In turn no other entrance could be found so-far. The detailed descriptions of the UFO tunnel from the "Babia G�ra" mountain, are presented in the Polish treatise [4B]. At the time of writing that treatise [4B] several people in Poland were still alive, who actually entered this UFO tunnel under "Babia G�ra".